Singapore, the Lion City, or the Garden City as we may call it, is the perfect destination with numerous fun-filled suggestions. Surrounded by greenery all the way, Tengah a probable ‘Forest Town’, as the National Development Minister Lawrence Wong said, earlier this year. The visualizations presented for the upcoming town were mesmerizing. The site was bounded by the Pan-Island expressways, Kranji, Brickland road, and Bukit Batok road. These were the placed mooted in 1991 as an initial concept of Singapore in the future. The place is also said to be the ‘industrial park of the future’, as described by the Finance Minister of Singapore, earlier this year in the budget statement. There is no doubt that the town is going to be a fun place to live in, not to mention, healthy as well. The master plan of this town has been in process since the past few years, but now, the time has finally come that more than 45,000 residential units are being prepared. The structure of the town has been comprehensively planned as seen in the infrastructure. The site for this new town represents only 1 percent of the total area of Singapore, and about 4 percent of the total green area of the entire island. 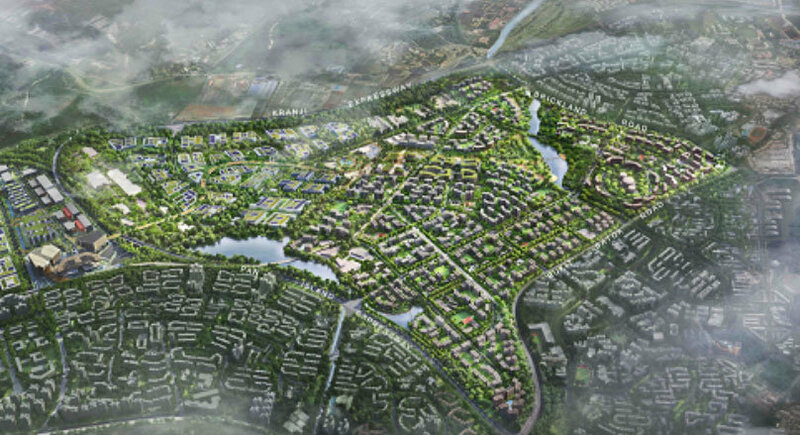 There is no doubt that Tengah is going to be a unique area, mixed with the development of technology as well as the naturally beautiful setting of the forest. The landforms would be retained, and the town is going to represent diversity at an entirely new level. The town is being designed in the middle of a lush green park, which is going to offer maximum connection to Mother Nature. Tengah represents an innovative way of lifestyle, with the views that are going to raise the residents’ standard of living. The main attractions of the town are also decided and are currently in process. The foremost point that everyone should know about Tengah is that the area is going to represent a car-lite environment, where vehicles would be used underneath the town center only. Therefore, this factor contributes to the circumstance that the residents would be able to walk around freely, without having to worry about any roads whatsoever. Moreover, the main focus of the developers of Singapore is to design a completely environment-friendly location, where people can benefit from nature and thus, community farms are also being prepared, which would allow community gardening and urban farming to the residents. Road networks are going to be set up to support the future needs of the town, however, the forms of mobility would probably be the autonomous cars or the self-driving cars, to provide maximum relaxation to the residents. Further plans are being sorted out for this fascinating town in Singapore. Plus, the accommodation options would also increase with time, so that the area is accessible to the tourists and travellers as well. Looking for your dream home?? New Launches such as The Clement Canopy, Lake Grande & Lakeville are just a short drive away from our future forest town. Luxurious condominiums such as Forest Woods and Principal Garden offer lush gardenscape and greenery that take us closer to nature.